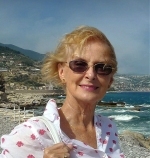 Orna O'Reilly is a retired interior designer who practised in South Africa, Mozambique and Ireland. Recently moved to the Veneto in Italy to write full time. First book published Renovate & Redecorate without Breaking a Nail, now writing a novel set in Venice. Moving to Italy was my dream. As I approached retirement age, I could be found most nights surfing the web, searching for my place in the sun. Those cold, wet winter evenings in Galway, Ireland, glass of red wine (Italian) and a few potato chips for company, I scanned a multitude of property websites in Italy. Any of you who has found, or is looking for, a property at long distance will sympathise. It is a long struggle, fraught with disappointment and frustration. Photographs of houses that look so charming on the Internet are not always so beautiful when you get up close and personal. It took me three years to find my dream home in Italy. First of all, I visited La Dolce Vita exhibition in London in 2010. This was a lot of fun, as apart from all the food and wine on offer, several estate agents from various parts of Italy were ranged over a multitude of exhibition stands. These stands displayed posters and leaflets of the houses they had on their books and were actively promoting their own regions. It was quite a lot to take in. From Puglia to Liguria, they were all there touting their wares. Apart from the myriad of estate agents, the remainder of the stands consisted, mainly, of regional fare and culinary happenings: celebrity chefs showed off their skills; the latest coffee machines were demonstrated; wine and olive oil tastings were well attended and meats and cheeses were being happily consumed by the hordes of visitors to the Business Design Centre in Islington. Delicious bites of salami and many sips of wine ensued as I wandered around the exhibition centre, picking up estate agent brochures from various stands. Eventually, I spotted a red-haired lady standing alone beside her estate agency display. We fell to talking and the upshot was that I agreed to fly out and look at homes in Lunigiana. No, I hadn’t heard of it before either, but it is a beautiful part of northern Tuscany, just behind eastern Liguria, with the Apuan Alps in the background. I made three journeys to Lunigiana, and, unfortunately, found nothing there that fitted the bill at that time; everything I saw was either too expensive or too remote. The only house I saw that I really liked, a Liberty-style villa, was BOTH too pricey and too far off the beaten track for me. My next Italian region to explore was Liguria, both east and west. Here I found that property prices had remained very high, despite having fallen throughout most of Italy over this period. The only properties I could have afforded would have seen me on the top floor of an anonymous apartment block. So, I continued my search elsewhere. I very nearly bought a beautiful property in Tuscany in 2012. A heavenly restored apartment in a small town about forty minutes from Pisa. My hopes soared. I could imagine my furniture and paintings installed. I was in love. I had, mentally, moved in. Unfortunately, my hopes were dashed when, because of a family dispute, the property was withdrawn from the market at the eleventh hour. To say I was disappointed would be an understatement. A brief look at Puglia was next. Everybody kept on about the low house prices down south, so I hopped on a flight to Brindisi and went looking. I will only say that, though Puglia is beautiful and I will return there for a holiday as soon as possible, it was not where I had pictured myself living in the long term. And the house prices were surprisingly high too. Tuscany was really my goal at the time, but I kept a reasonably open mind on the subject, which was sensible, I thought. However, I was continually frustrated by my inability to find the perfect property and I kept up my nightly vigil on the Internet with my wine and chips until – suddenly – there it was. Small and perfectly formed, fitting my wish-list perfectly, my new home near Padova in the Euganean Hills. Not Tuscany then, but the Veneto. I flew out to Venice immediately and met with the estate agent, who was extremely professional and spoke perfect English, which was a great help. We came straight to the house and I knew I had not been wrong. It was and is perfect. So keep on searching. Your ideal home in Italy is out there just waiting for you. Make a list of your requirements – stick to them – and know that everything will fall into place when the time is right. My best friend moved to Italy last year and she is so happy. She told me that she feels like home there and she can’t imagine to live somewhere else in the world. I am going to visit her this summer to see her little paradise.